Ring, Dark Water, The Eye, The Grudge, Mirrors, it’s likely that you’ve probably heard of or even seen one of these movies. However, I am referring to the original versions of these films and not the poorly remade American ones. Those remakes and ones like it sucked the essence out of what made the originals so great and now they’re almost entirely forgotten. Many years ago, I began watching these types of films and began to notice a trend amongst them all. At the top of each of the DVD cases were the words “Tartan Asia Extreme”. TAE or Tartan Films was a UK based distributor that was established in 1984 and was responsible for making the films above and others like it available to the masses. Seeing those words at the top of a DVD would almost always guarantee that I was in for something memorable. As this is my first TAE movie review, I thought it would be fitting to start with one of my all-time favourites, R-Point. The idea of watching an entirely subtitled movie may seem odd at first but if you truly give it a chance you’ll completely forget that they’re even there and be rewarded with many original, unique, scary and memorable horror movies. 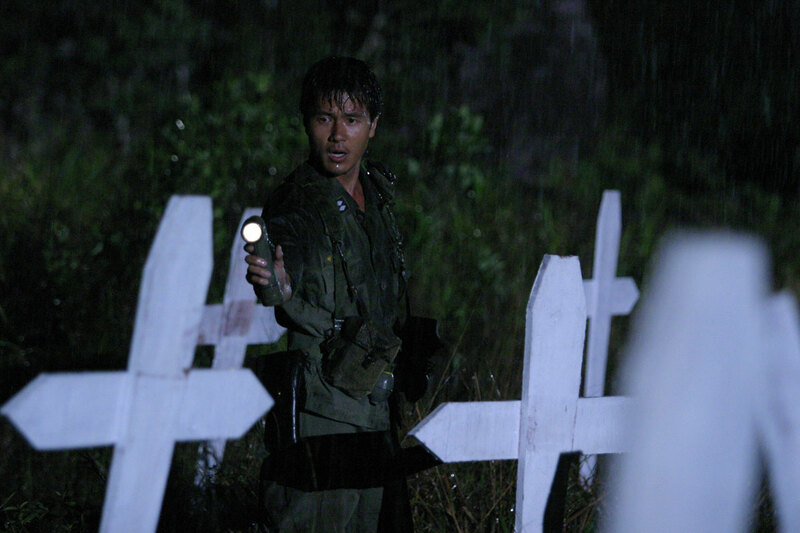 R-Point is a Korean horror film Set in 1972 Vietnam, during the Vietnam War. On 7 January 1972, a South Korean base in, Vietnam, receives a radio transmission from a missing platoon that has been presumed dead. 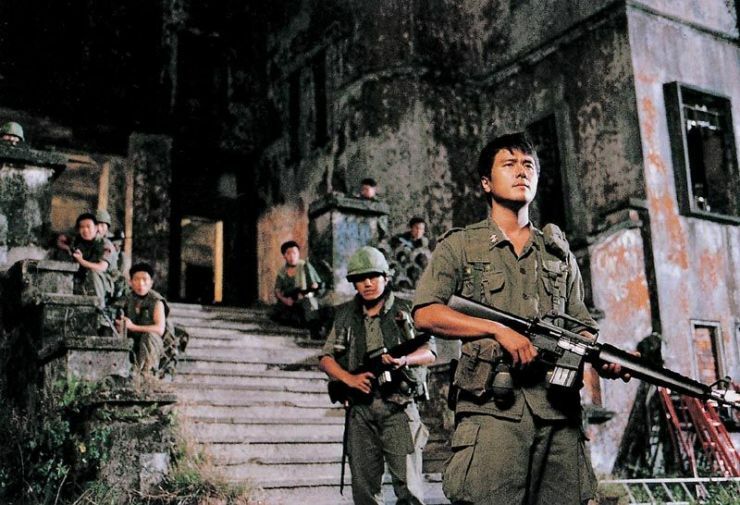 The high-command assigns the veteran and decorated Lieutenant Choi Tae-in to lead a squad of eight other soldiers to extract the missing soldiers from the rendezvous point or R-Point. 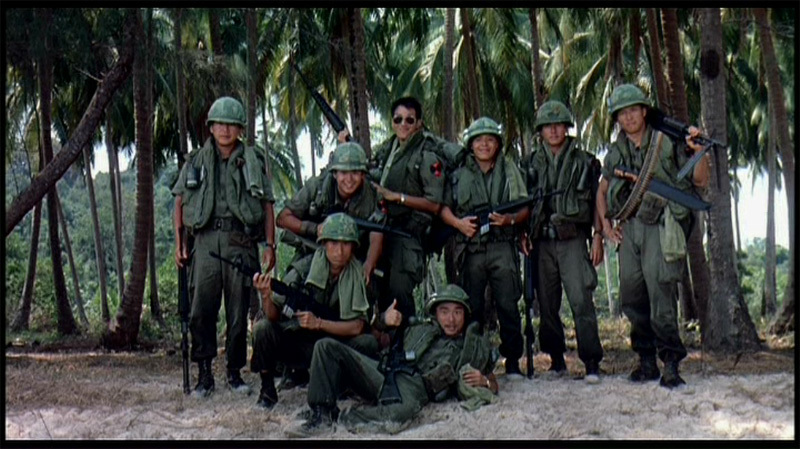 When they arrive at the location, they engage and defeat a Vietnamese woman with a machine gun and leave her for dead. They later find a tombstone with an engraving that says one hundred years previously, local Vietnamese were killed by the Chinese who disposed of them in a lake. A temple built over the site has become a sacred location to the Vietnamese; it also explains that any persons with blood on their hands would not return. They find a huge, but empty mansion, where they set up their base. What follows isn’t an action-heavy horror movie, but a tenser, atmospheric exploration of the lines between the supernatural and reality. 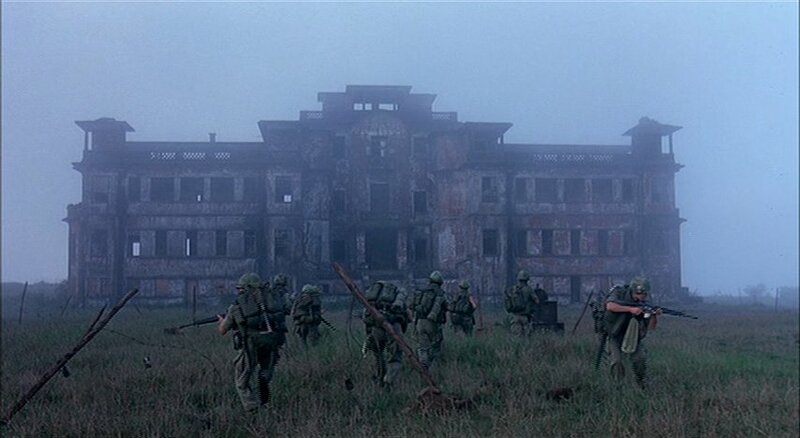 Surrounded by miles of jungle and rumours of ghosts, the soldiers begin to crack under the pressures of their situation and begin to turn on one another. It’s difficult to describe what they encounter without giving too much away but the physical pressures of the jungle combined with the psychological pressures of the legends of R-Point are captured brilliantly both by the camera-work and the actors portraying their private descents into madness. There are a number of standout moments but I’ll only go over a few of them to avoid spoiling it entirely for anyone that doesn’t want to be spoiled. One of my favourites involves a soldier who commits suicide, although his actual death takes place off screen. His body is discovered in dramatic circumstances and is then placed in a body bag and stashed in one of the upstairs rooms in the mansion. Lieutenant Choi informs his commanding officer of the death via the radio and explains that they are now down to 8 men from 9; this information shocks his commanding officer. He explains that Lieutenant Choi’s team was made up of just 8 men and not 9 even though they had 9 men when they arrived on the island. This is a very creepy reveal and it’s even more so when you remember that the other soldiers had been hanging out with the 9th man and even took a photo with him when they arrived, although he doesn’t appear in it now. The next involves an American platoon that arrives at the mansion to pick up some supplies from a second floor room. After collecting the supplies and before leaving, the commanding officer of the American team tells Choi they will return in 4 days and to not tamper with their stuff in the room. Later in the film, Choi discovers a crashed helicopter which reveals that the American team had not even been to the mansion to collect supplies at all, they’re dead but they will return in 4 days…. I could go on and on praising this film and its clever execution of creepy moments and tense atmosphere but I’ll just say this. R-point is tense, creepy and definitely worth watching, it never goes over the top and remains controlled, I dare anyone to watch this film alone at night and not feel scared as the story unfolds and things become clear. The finale is seriously tense and well executed as well as being brilliantly acted, although we don’t learn much about these men the ways in which they realistically interact makes them likeable. However, R-point isn’t perfect and comes with a few flaws. I found some of the dialogues to be poorly written, it made me wonder if the translation had made some mistakes during certain conversations. While I really enjoyed the story, some might find it to be slightly confusing; it definitely requires some thought as certain aspects are not fully explained. Finally, I thought more could have been done to make it easier to tell each of the men apart; they mostly keep their helmets on the whole time and it can get confusing.